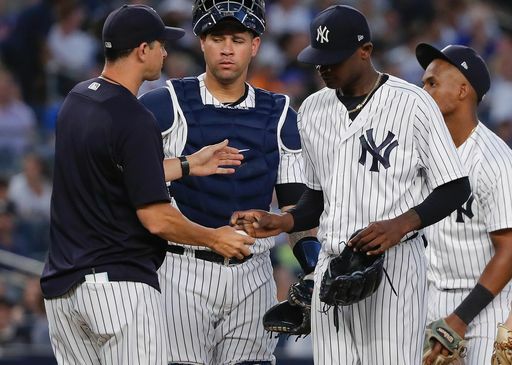 Domingo German put the Yankees in a hole early with another rough start, and the Yankees were not able to rally off enough runs versus Noah Sydnergaard and the Mets' bullpen as they dropped game one of the Subway Series 7-5. German gave up extra base hits in bunches as he allowed five of them in only 3.2 innings of work. His control was not sharp as he was constantly missing his spots in pitcher’s counts. Adam Warren relieved German and was not at his best either as he allowed two runs on two hits and three walks. On the offensive side of the ball, the Yankees chipped away, but fell short. Stanton hit a sac-fly in the third, the only run charged to Thor, to get the Yankees on the board. Then, Neil Walker doubled in a pair to get the Yankees within three runs. In the eighth, Didi Gregorius doubled in a run to make it 6-4, and Stanton grounded out to knock Judge in to make it a one-run game. However, the Yankees failed to score the tying run that inning, and Gsellman locked down the save in the ninth. The Yankees fall to 62-34 and are now 5.5 games back of Boston in the AL East standings. German was also sent down following the game, and Luis Cessa is expected to take his spot in the rotation. Domingo Acevedo is reportedly going to be called up to replace German on the roster. The Yankees will try to even the series up tomorrow as Sonny Gray will pitch versus Steven Matz. First pitch is scheduled for 1:05 PM ET in the Bronx.